Window sills add to the overall appearance of a structure’s exterior. 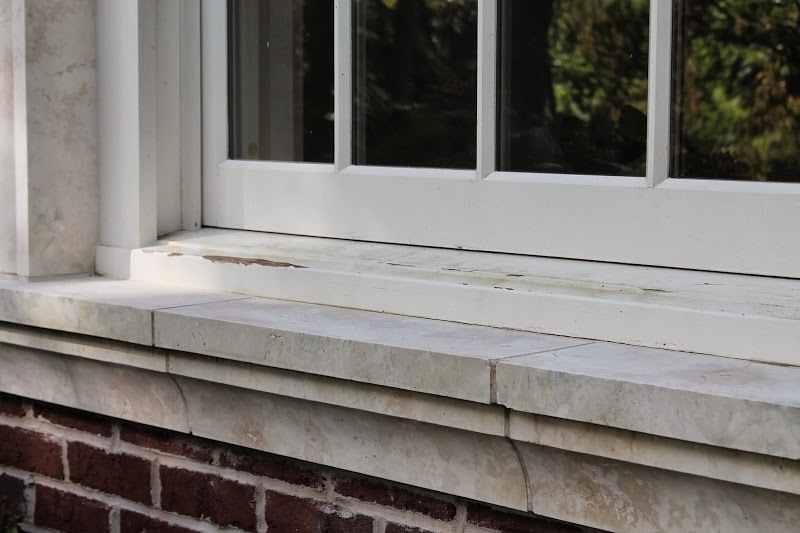 The placement of natural stone sills is a good investment in the property, and those who install sills made from marble will not only benefit from the strength and durability of this material, they will also be providing a sturdy, long-lasting support for the entire window frame. Although heavy, marble can be supported properly by reinforcing the wood frame, and the result is a very tight water seal that helps lower energy costs and extends the life of the frame itself. An exterior window frame also allows property owners to display gnomes, flower vases, and other items in such a way that they are easily visible to others. A flat window sill made from wood can be treated with water sealant and paint, but the overall cost to maintain a wooden sill is actually much higher than what can be expected with premium quality marble. When considering the installation of exterior window sills for a residential or commercial development, think about the advantages of using a natural stone such as marble. Below is a list that explains the benefits of using marble sills as well as why this material is actually a good investment despite the slightly higher cost of installation. Marble has long been a favored building material, even back in the days of the Roman Empire. This natural stone is metamorphic in formation, composed primarily of carbonate minerals. The extreme pressures that form a folded mountain range is what causes the minerals to compact into a strong, beautiful stone material. Buyers have the choice of numerous color shades and striation patterns. All marble types can be polished or honed, the result being a very shiny, bright stone that has extremely good light reflectivity. When properly cut and shaped, the appearance of a marble sill is without equal. Natural stone such as marble, slate, or granite absorbs very little moisture and is unaffected by extreme changes in temperature and humidity. In other words, marble weathers quite slowly and is therefore an excellent choice as an exterior building material. Many of the marble columns, wall tiles, and window sills one sees on building exteriors was once part of an older structure. When that older building was demolished, the stone was saved and used again. This clearly demonstrates how durable and long-lasting marble truly is. Most likely it will outlast the rest of the house or commercial structure onto which it was originally placed. Marble sills have a life expectancy of up to 200 years before the stone begins to show a noticeable, irreversible fade. Polished marble does not attract dirt or grease, nor does dust or grime cling to the stone. 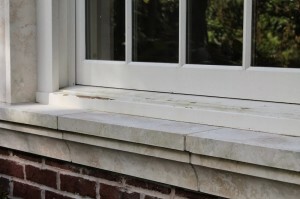 Exterior sills made from marble are generally kept clean by rain. Soot in the atmosphere does very little to fade or darken the stone itself. Wiping the occasional bird dropping or natural stain from marble is easily accomplished without the use of chemical cleaners. If the stone has been given a specialty water seal coating, the patterning, striations, and blotching will stand out clearly for many, many years. There is very little physical labor involved with keeping marble looking shiny and bright. As stated, marble does not collect dirt readily, nor does it fade from exposure to atmospheric particulates. The most common maintenance procedures required to keep the stone looking its best is an occasional re-polishing or waxing. The grout or cement seal around the stone will also have to be attended to from time to time, but this is no different than maintaining the perimeter of a wooden exterior sill. Although this natural stone has tiny inclusions, water does not readily seep through. If the stone is given a thorough polishing and sealing, the stone acts as an efficient water barrier. An occasional waxing or sealing will prevent contaminated water from causing the appearance to fade over time. Marble is a dense rock that will not bow or expand when subjected to variable temperatures or atmospheric pressures. The stone can actually be used as a supporting base for heavily glassed window frames. Some exterior window sills are up to 14 inches in width, meaning that the stone can be fitted underneath part of the frame itself. Most importantly, the strength of marble will extend the life of the frame because it does not buckle or warp. This is perhaps the most important factor to consider when choosing the material for exterior window frames. Wood frames absorb moisture over time, and the result is a weakening of the entire frame. Eventually, the frame begins to sink or buckle. Replacing window frames is costly and involves tearing away an entire section of sheetrock on the inside wall. A properly installed marble window sill will prevent moisture intrusion and greatly extend the usable life of the wood frame, window, and interior wall surface. Moist rot occurs primarily around window frames, but using marble as the sill material will virtually eliminate this possibility. Although cold, marble does not act as a heat conductor, meaning that less heat will escape through the lower window frame, and this saves the property owner a lot of money. This is one of the reasons many building designers prefer to use natural stone for accent features and highlighted exterior surfaces. Marble reflects light efficiently without absorbing much UV or infrared frequencies. This means that the color will not fade, nor will the rock crystals separate or weaken over time. Sunlight causes even less damage to marble than does water or airborne contaminants. Top-quality marble window sills have been expertly cut and shaped, have been given rounded and smoothed edges, and have been polished or honed. Although marble can be broken by a sharp blow, it is extremely tolerant to oblique pressures. The stone will not crack or chip if it is supporting heavy weights. The edges of an exterior window sill made of marble will not chip away if struck by a falling tree limb. An appraiser not only takes a good look at how a home or commercial structure has been maintained, he or she also takes note of the materials used. In other words, a structure’s appraised value takes into account whether the median sales price would be noticeably affected by how the structure stands up to the test of time. A home may look nice today, but an appraiser can quickly spot trouble that might not occur for several more years. Marble is an excellent investment in the property. As mentioned above, this natural stone material serves to extend the life of other materials used around a window frame. Because maintenance costs are low and replacement is almost never an issue, the initial investment in purchasing marble is recouped rather quickly. The cost of replacing windows, exterior wall surfaces, and other areas around a structure’s exterior continues to rise because the specialty contractors who perform the work must pay an increasingly higher amount for insurance and bonding. Using long-lasting, durable materials such as natural stone makes sense if one wants to keep maintenance costs low. The use of marble as a functional material – particularly as a window sill, floor tile, or threshold – is not lost on an appraiser. Marble truly increases the value of the property. Stonexchange is a direct importer and distributor of marble window sills, thresholds, and tiles. Our company manufactures everything we sell. Construction companies, flooring product retailers, and independent installers of natural stone building products can rely on us for prompt delivery, guaranteed availability of product, and the lowest bulk-order prices in the industry. Stonexchange imports fully loaded containers of top-quality marble on a year-round basis. Our Miami-area distribution center is loaded with the most commonly used and sought-after color shades used for both classic and contemporary designs. We also perform custom fabrication of non-standard size sills and other materials, and we do not charge extra for this service. Contractors who purchase material independently will benefit from out bulk-order process. Merchants who desire a large inventory of marble product in anticipation of sales to installers will likewise save money when ordering direct from Stonexchange. We carry cream/beige, off/white and gray, pure white engineered stone, and even black granite. In addition to our line of marble window sills and thresholds, we also fabricate and import building products made from travertine, paver stone, and ceramic. For the lowest prices in the industry, contact us via phone or email. We will be happy to provide your company with detailed information regarding our fine-quality exterior window sills made from premium natural marble stone. We ship our materials across the entire continental United States, and we guarantee rapid order processing and fast delivery on all our marble products.